We know that Hawaii has some interesting customs and ways of going about things. From legends and folklore to fascinating island history and geographic phenomenons, it can be easy for visitors have many questions about Hawaii. To help simplify and prepare you for your next trip to these beautiful islands, we’ll unravel some of your questions about Hawaii right here. This is a good one to know. Next time you are a guest in someone’s home in Hawaii, be sure to remove your shoes at the door. This practice has come from Hawaiian, Chinese and Japanese cultures and shows a sign of respect and of course prevents you from tracking in dirt, mud, debris, germs, etc. You may even notice upon arrival, the piles of shoes lined up at the door. Take note and take off those shoes! You may find yourself confused when you hear people referring to ‘slippers’. No – they are not the same fuzzy slippers you wear around the house while in your pajamas. Slippers (or “slippahs” as some locals pronounce them) in Hawaii are flip flops. In a tropical climate like ours, slippers do the job for most days. We’ve even got slippers for different occasions ranging from casual beach slippers to fancy slippers perfect for a nice social event. No, they are not rats. These weasel-like carnivores actually eat rats. These ferrets of Hawaii are the Small Asian Mongoose. You may see them run across the road in front of you or sneak by out of the corner of your eye without ever getting a good look. They are incredibly fast creatures that were brought to the island in the late 1800s to help take out the rats damaging sugarcane crops. This invasive species has thrived beyond measure on our islands and has sadly done some serious damage to bird species. With large numbers, you may see these critters from time to time while visiting. 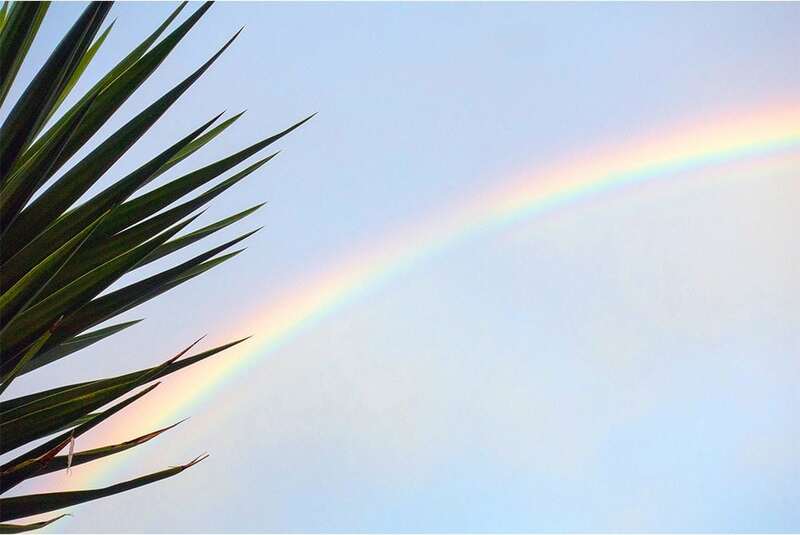 Hawaii is known as the Rainbow State for good reason. We see rainbows all over the place! The Hawaiian Islands are the perfect setting for rainbows. Here’s why: the trade winds gather moisture and carries it until it hits the mountains. The moisture around our mountains mixes with this and the bright, plentiful sunlight creating fantastic rainbows. The salt in the air even provides a prismatic effect amplifying the colors in the rainbow. Rainbows are best seen early in the morning or late in the afternoon.